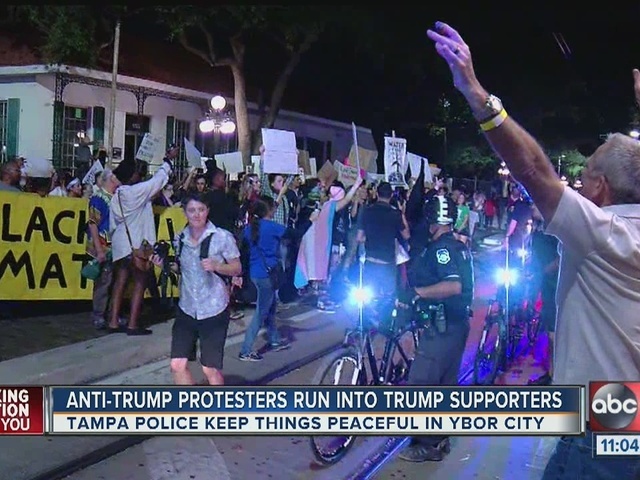 A peaceful protest on the streets of Ybor City, Florida nearly turned into a street brawl before Tampa Police officers jumping in and quickly diffusing the situation. Around 7:30 p.m., Thursday protesters began walking down a street chanting against President-elect Donald Trump. Their route took them past a lot of bars and restaurants but once they got to an Irish Pub that was one of the stops for a pub crawl that a lot of Marine Corp. members were a part of, things got dicey. Police had to create a human barrier between the opposing groups as members on both sides screamed obscenities and gave each other the middle finger. 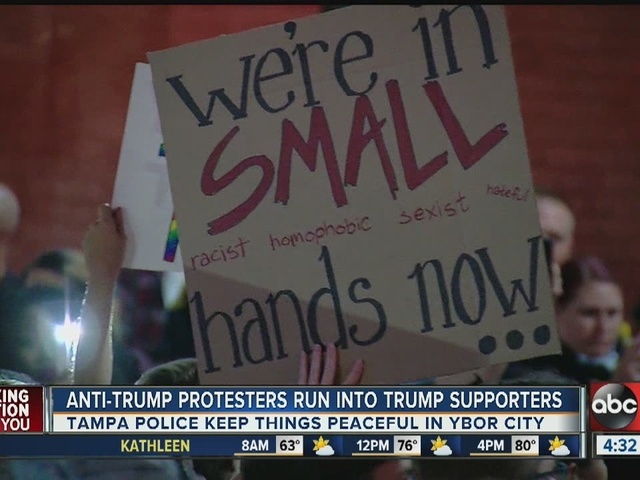 Protesters told Tampa-based WFTS reporter Michael Paluska they want to protest peacefully and let the country know they feel cheated by Tuesday’s election. Protesters hope that the divisive language Trump used before the general election was just something he did to motivate his base. Tampa police used the street car and their mounted bike patrols to keep protesters from marching to the interstate. Except for the brief run in with the Trump supporters the rally was peaceful and there were no reports of any arrests. Trump supporters having dinner in Ybor City shouted “go Trump” at the protesters. They think their marches are a waste of time and that people who voted for Hillary Clinton need to get over it and move on.